Over the last few months, I have completed all spline work within the Ardglen area, including the ballast sidings, and also to a point about halfway between Ardglen and Pangela. 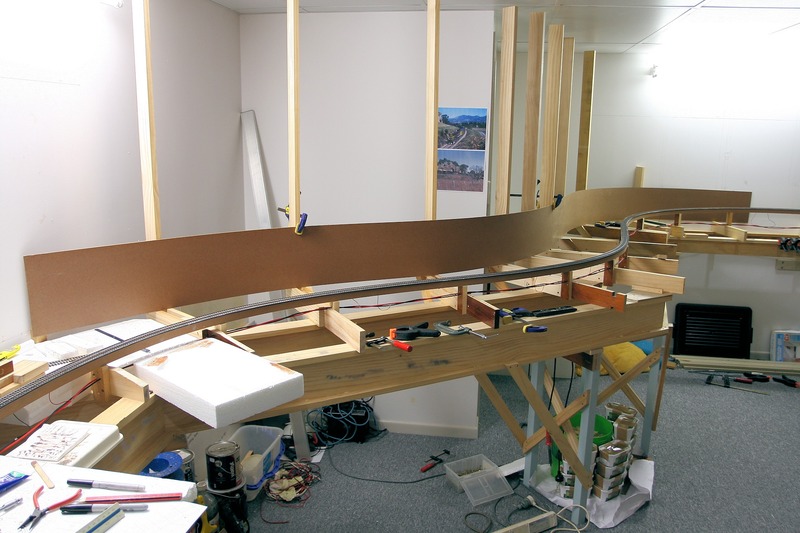 This now means I have completed construction of 80% of total spline, which equates to 292 feet (88.5 metres) with just 74 feet (22.5 metres) of spline left to build through Pangela and to connect up to the helix. The two images below are views of Ardglen from either end, showing the storage and goods sidings. The next image is a shot further down the grade from Ardglen, looking back towards the ballast sidings coming off the quarry road. The next image shows the shunting neck at the end of the quarry road. The next image shows a general view of the section above Temple Court. I have yet to finalise setting the grade in this section. Temple Court has been covered with drop sheets to protect the scenery from dust and dirt whilst working above. The next series of images show the spline from Ardglen tunnel through to a point about halfway to Pangela. Since my last post, I have been busy with work on the upper deck above the Chilcott’s Ck to Kankool section. 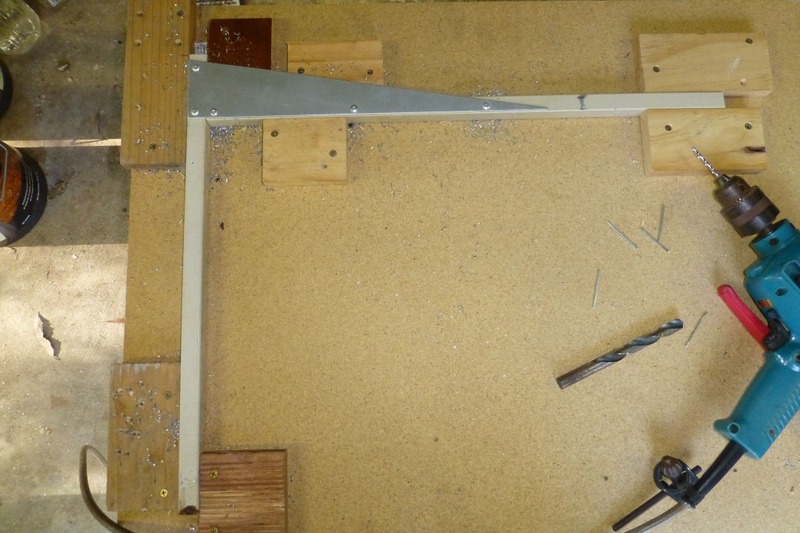 To support the upper deck valance and future lighting, steel brackets were fabricated from second hand 20x20mm square tube, along with bracing made from thin steel plate. 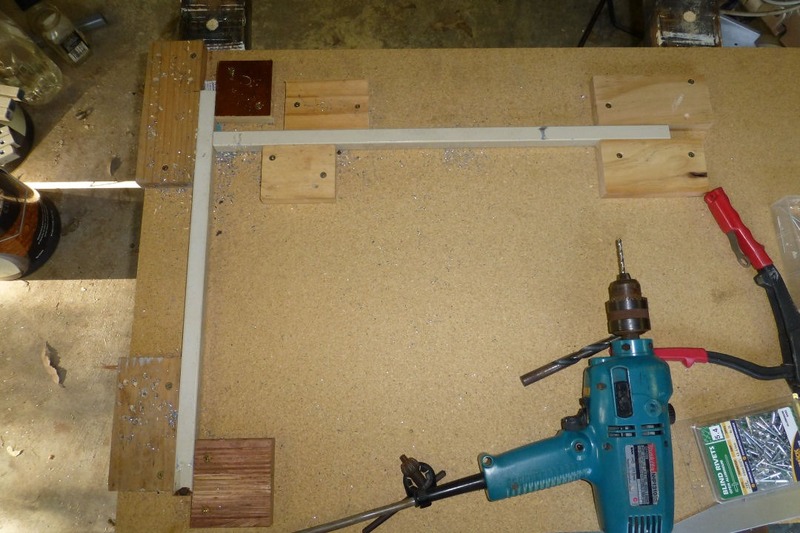 A simple timber jig was made to hold the pieces of tube in place whilst the brace plate was attached using pop rivets. 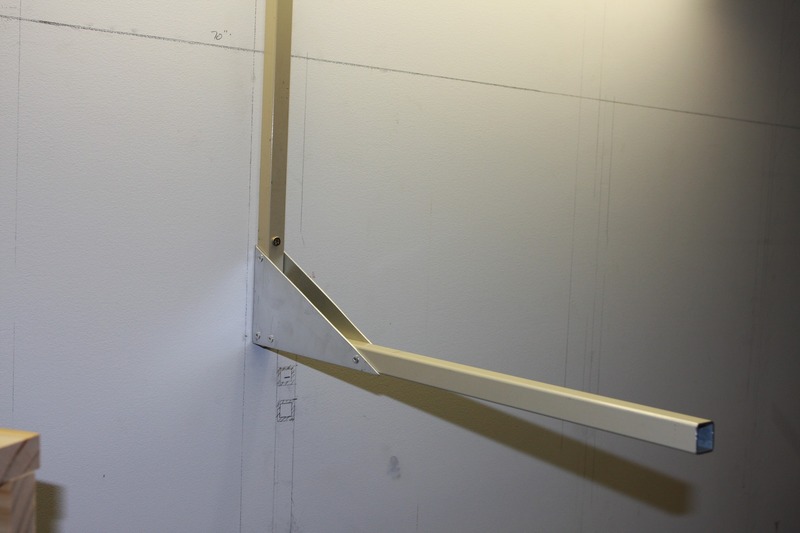 These brackets were then screwed to the wall at strategic locations at wall studs. After the initial installation of these brackets, I discovered a potential flaw in my design. The two rivets fixing the brace plate to the vertical tube were shearing off with only minimal downward force being exerted at the outer end of the horizontal tube. Now, I’m not sure whether it was actual rivet failure or what, so I decided to replace these rivets with a 3/16” bolt/spring washer/nut combination. The result is a much stronger feeling bracket. 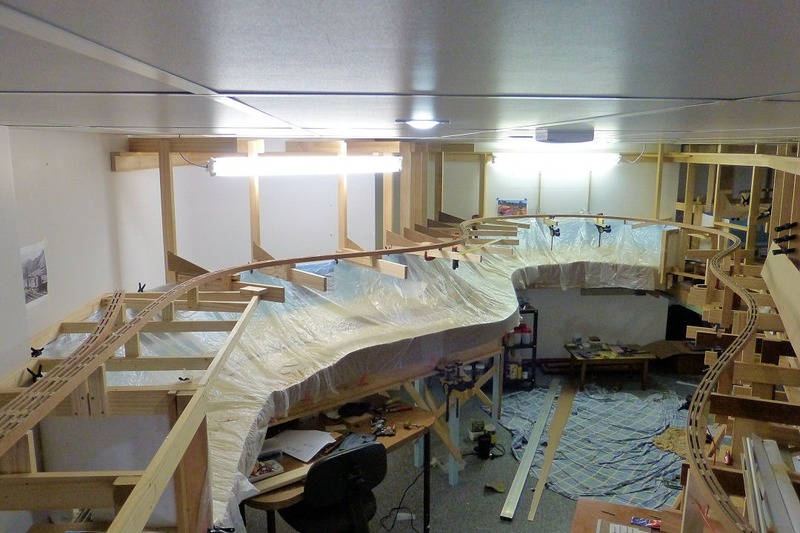 I had also decided to install a ceiling above each scene, as I didn’t fancy the idea of being able to see the open benchwork when looking along the scene from one end. Once painted, I also think it will assist in spreading the light onto the scene. 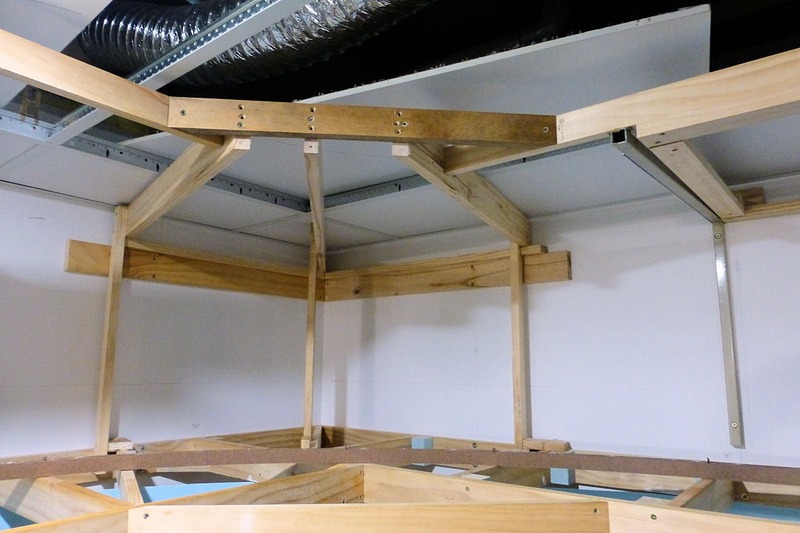 The ceiling is made from sheets of 3.2mm MDF (2440x1220mm). 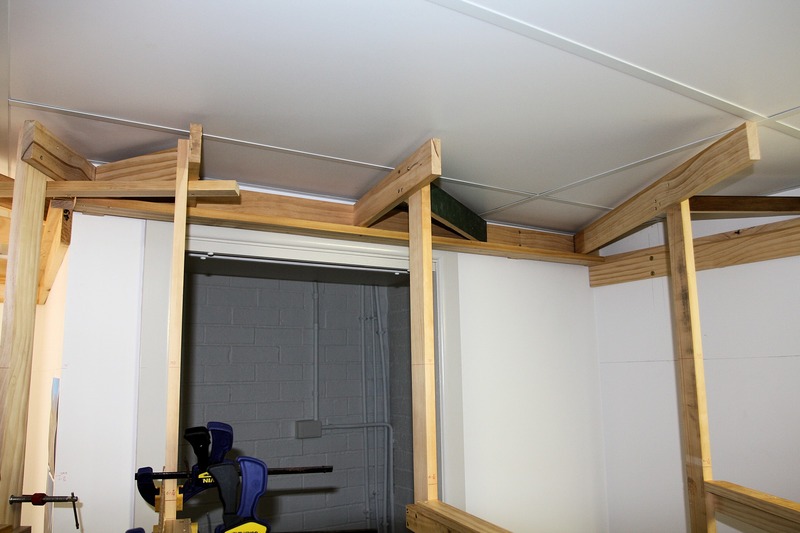 This required the installation of a timber sub-frame built around the steel brackets to allow for the securing of the ceiling. 2×1 DAR pine was used. 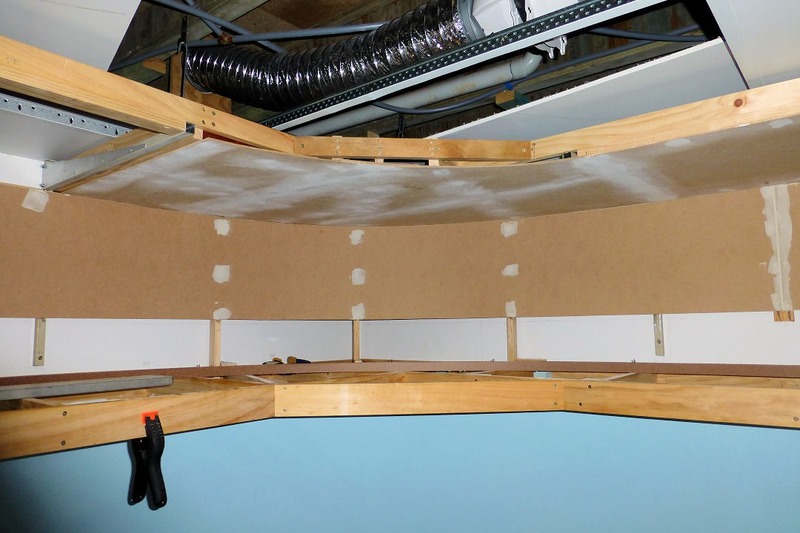 More framing was also installed in the corner to support the backscene and ceiling. 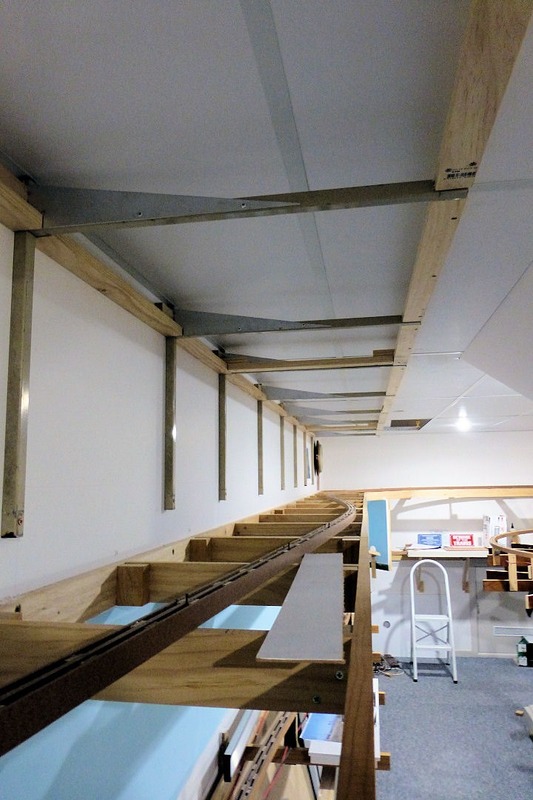 A ceiling section was cut to size from the MDF and secured to the timber frame using Liquid Nails and small gauge countersunk screws. The adhesive was also applied to the steel tube. 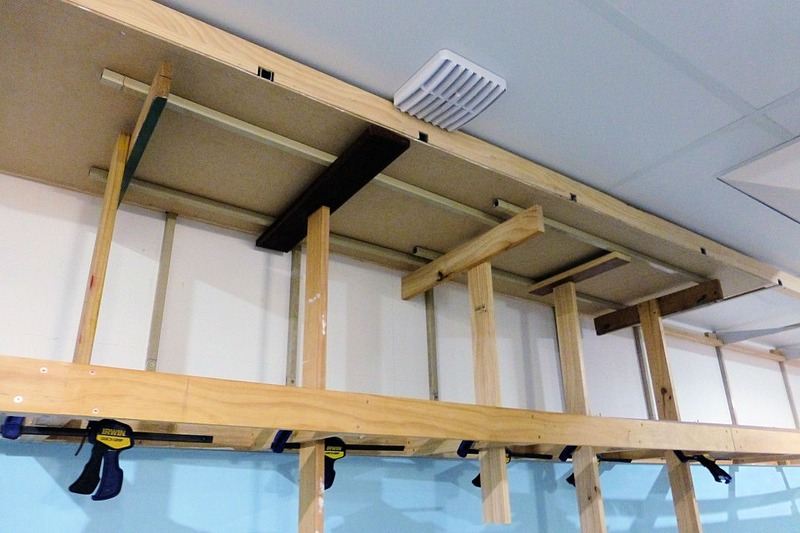 Temporary supports were used to hold the ceiling in place whilst fixing the screws. 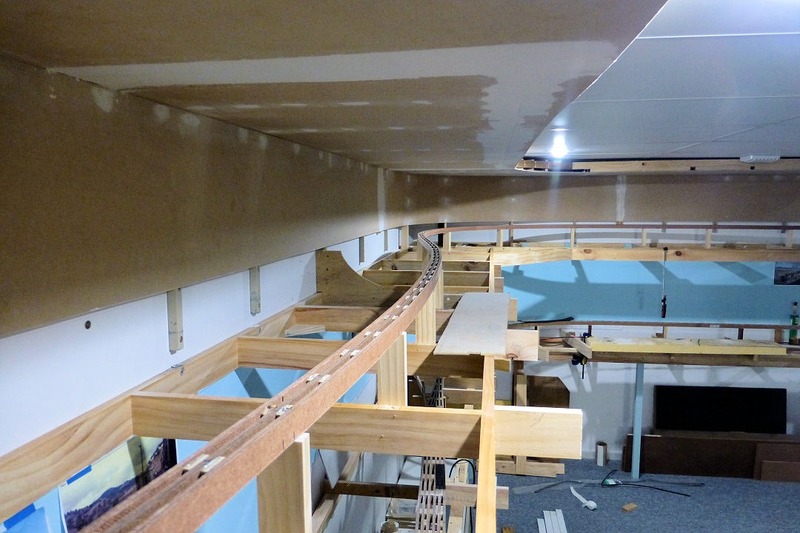 After the screws were installed, extra temporary supports were fitted to force the ceiling against the steel tube whilst the adhesive cured. 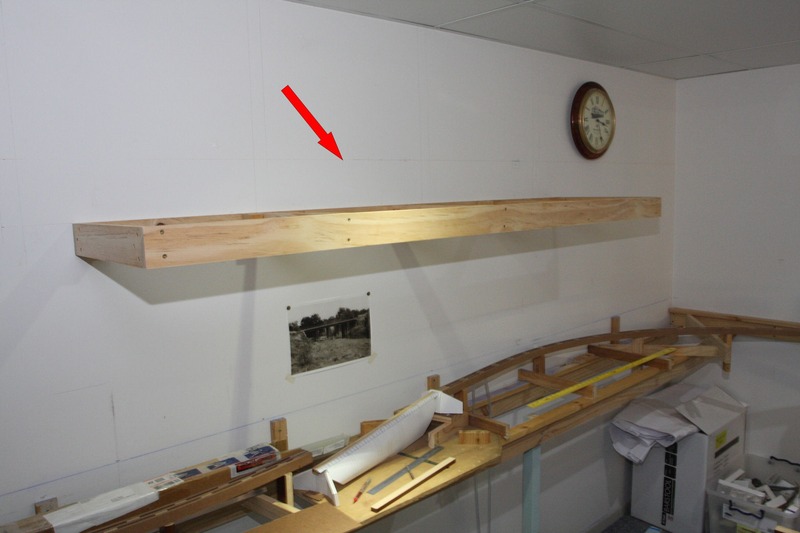 The ceiling section in the corner proved to be quite tricky to cut to size, but by using accurate measurements, I ended up with a piece that fitted perfectly. 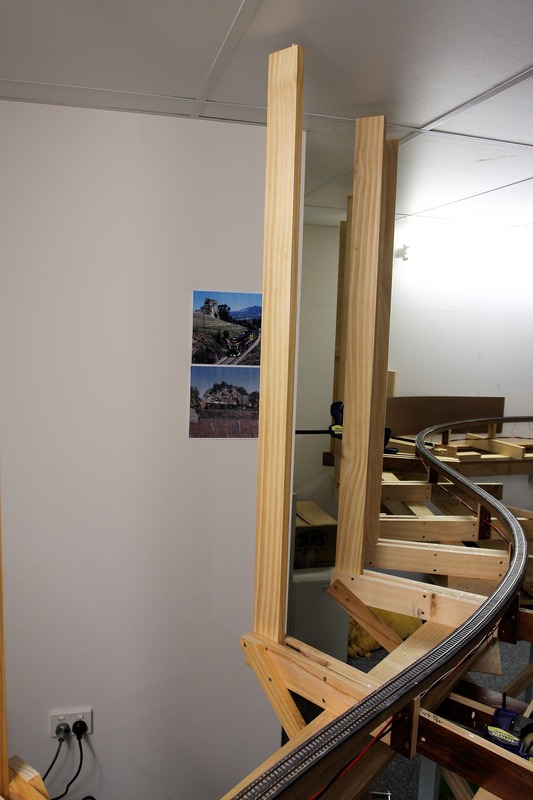 A couple more sections of backscene was also installed, including the piece in the corner. 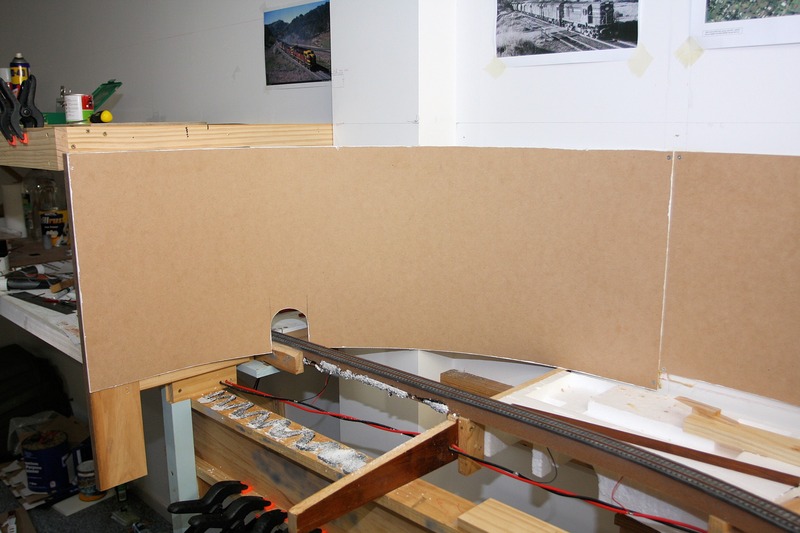 These sections of backscene have no need to extend completely down to the benchwork, as the track level will be around where the lower edge of the MDF is in the picture above, and the majority of scenery here behind the track will be hills covered with trees. 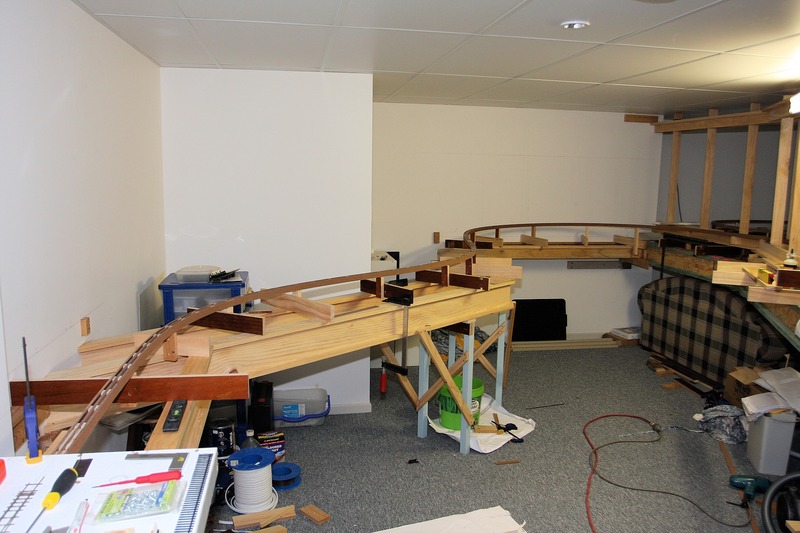 I also started playing around with how I will locate the Kankool lever frame into the fascia. The picture below shows a mock-up of what I hope to achieve. 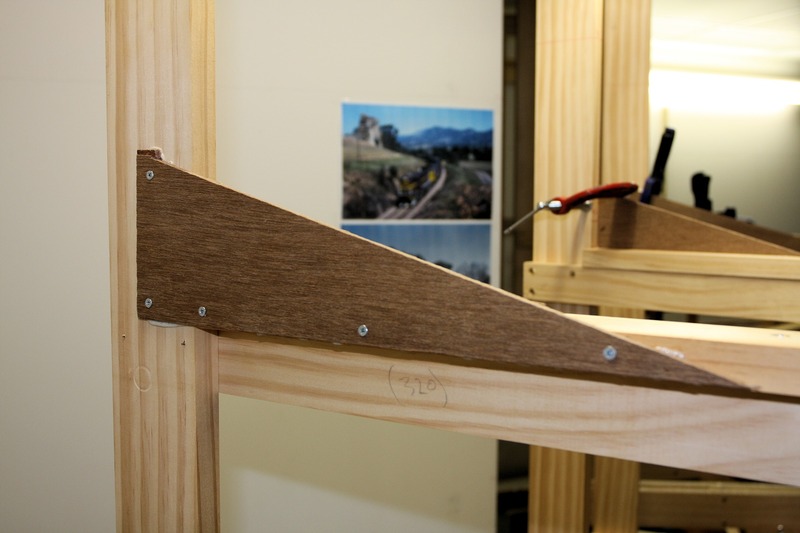 The MDF immediately behind the frame will be the scene fascia and the curved piece in front is to indicate another section of fascia that will serve as ‘protection’ for the frame. More on this later. Well things have been pretty quiet since my post in late August. During September, myself, Jodi and Connor went to the United Kingdom for a holiday. We all had a great time but were glad to be home after being away for a month. 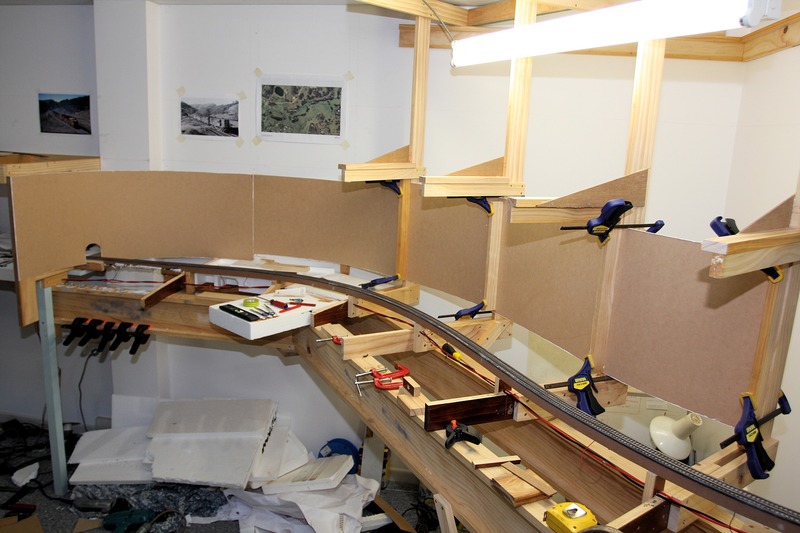 Work on the layout was pretty much non existent since we returned in early October, but a few weeks ago Andrew and I cut up some masonite sheets for more supplies of spline strips, and this spurred me on to complete the section of spline from the bottom of the helix round to the Down storage yard. Since my post way back in January this year about incorporating an additional crossing loop in this section, I have since changed my mind again and decided to just make it a scene from the area around Temple Court, which is between Pangela and Murrurundi. The main reason for not going ahead with Wingen, is that trains just wouldn’t have been in the right context for that location (I know – picky, picky! ). If an UP train was being banked in the front all the way from Willow Tree, the bank engines, which were sometimes attached “in the shafts”, normally would have been detached at Murrurundi, and therefore a train with bank engines attached would have looked out of place at Wingen, which is further south from Murrurundi. I had come across a couple of great pictures showing a big granite rocky outcrop at Temple Court that was just begging to be modelled. a granite outcrop near Temple Court on 19 May 1982. The 44 and 48 are the bank engines. I have also laid down the foam roadbed in this section in preparation for commencement of laying down the Central Valley tie strips. 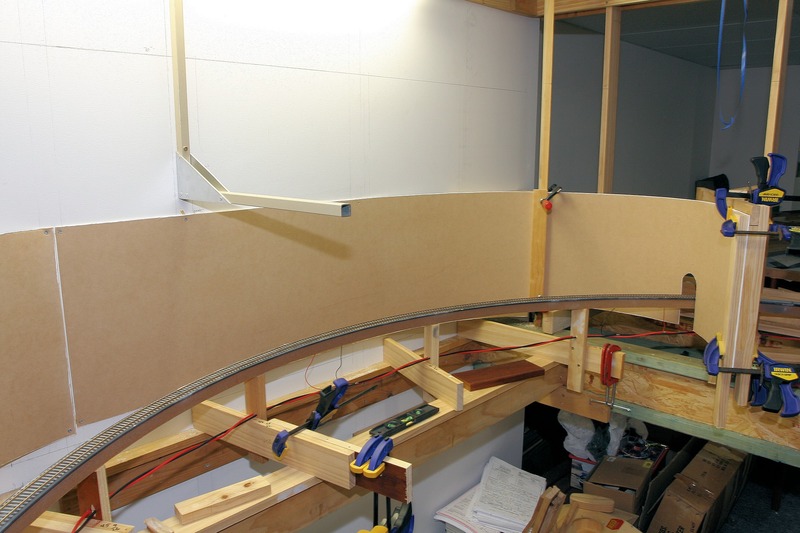 The photo below shows the foam in place on top of the spline. 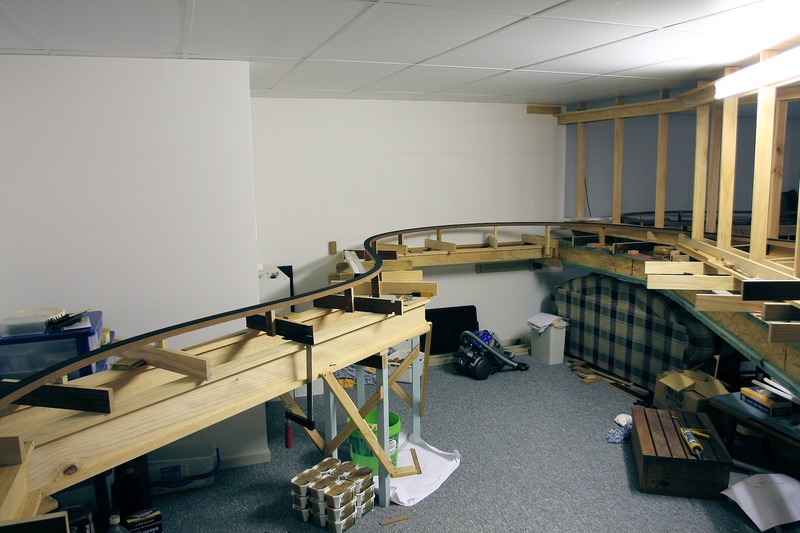 I also installed a few more sections of the PECO flextrack from where I finished off when tracklaying in the helix. See previous post. 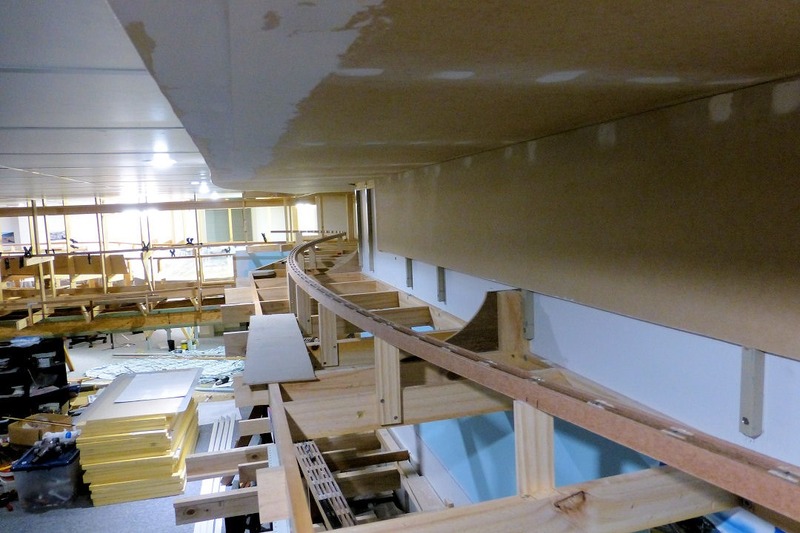 There will be one more length of flextrack installed than in the photo above, which will be close to where this section of track will emerge into the new Temple Court scene. 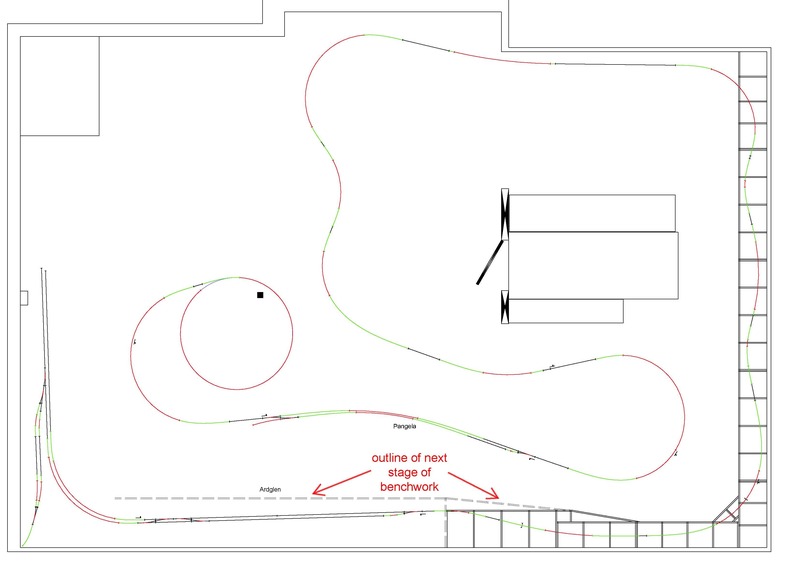 The CV track will then be laid all the way back to the staging yards. 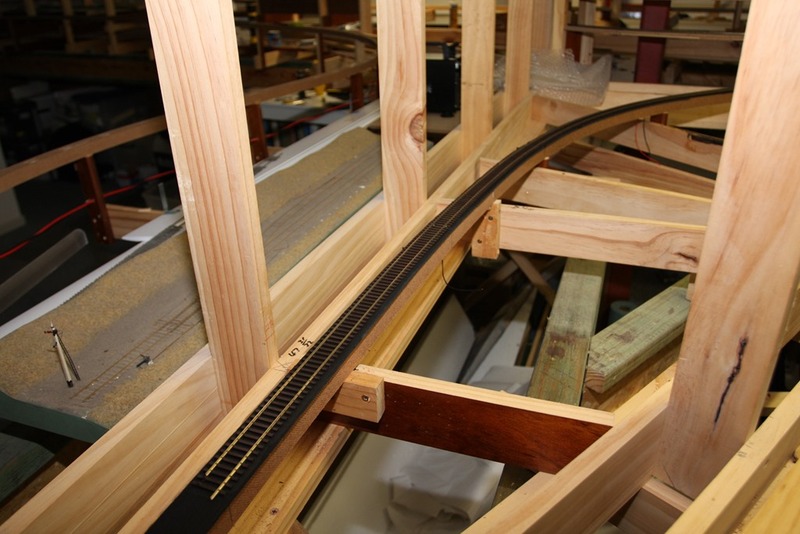 Over the next few weeks, I plan to carry out some tests on painting the CV track in readiness for laying. I will keep you all updated as that progresses. 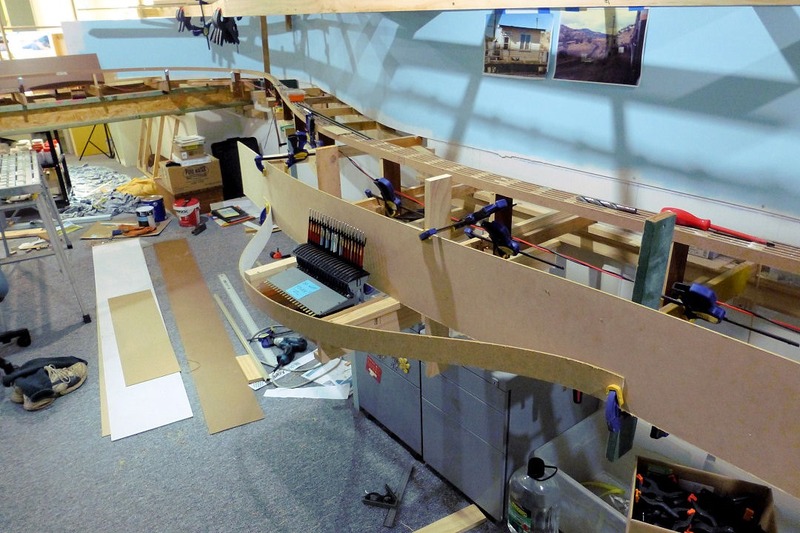 Upper deck benchwork Part II .. 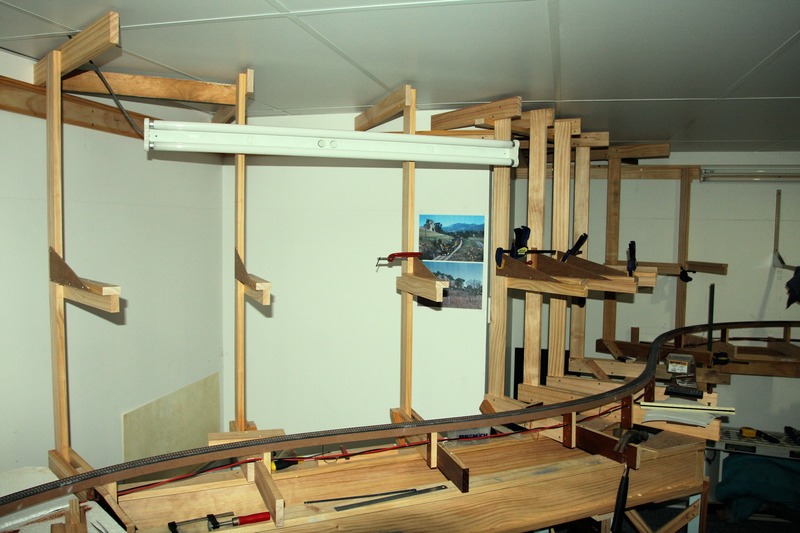 I have been continuing with more benchwork for the upper deck above the storage yards and towards Kankool. 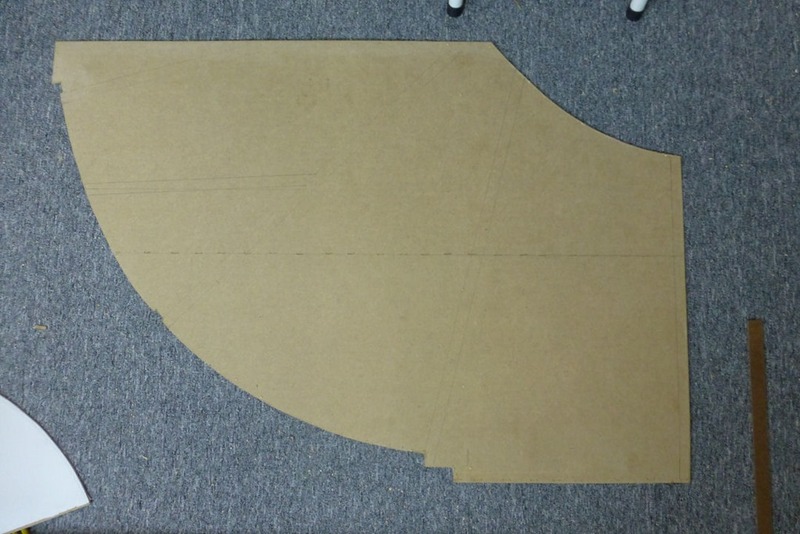 After the first section was installed, I decided to build the corner section. This consisted of a section back into the corner then another section at right angles above the storage yards. Once the corner was in, I then proceeded to make four more modules and attach them along the wall towards Kankool. The last module is currently supported by a temporary post until the next section is installed above Kankool. I found that once a module was secured to an adjacent one, the whole structure stiffened up and the ‘springyness’ was reduced, especially in the corner. The next two sections above the storage yards were built and attached. 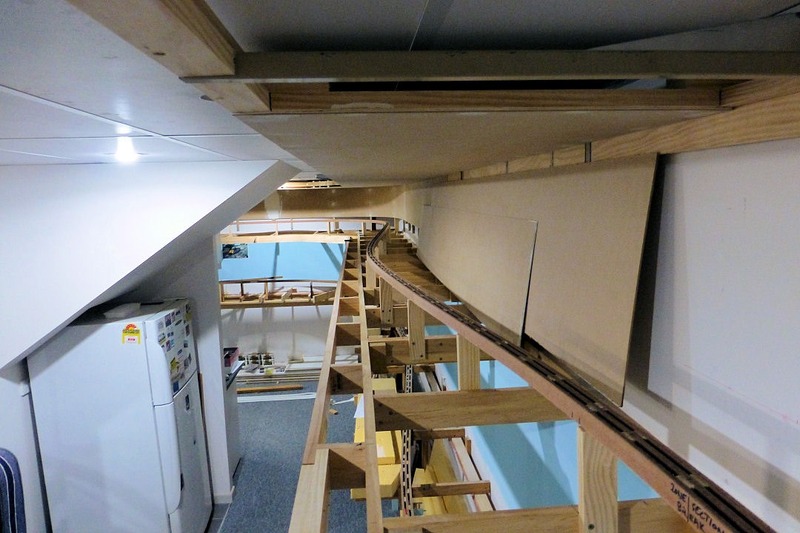 As can be seen from the photos below, I have made the upper deck follow the edge of the storage yards, as I needed to maintain maximum aisle way clearance here at the peninsular. Besides, the only scenery in this corner will be a huge hill that the tunnel dives into. 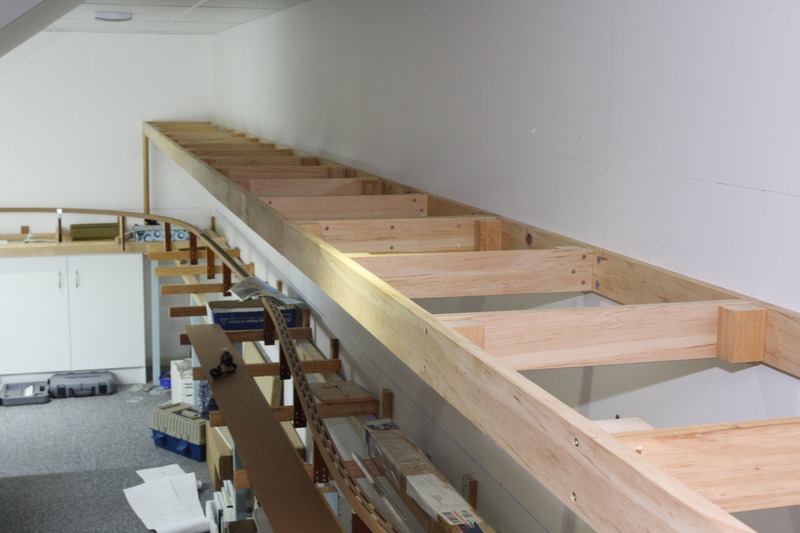 As the upper deck sections proceed along above the storage yards, they will reach a maximum depth of about 800mm and will need to be supported by brackets. In the photos above, the depth increases from 420mm to 600mm, with the next stage as shown in the drawing below pushing out to 800mm. 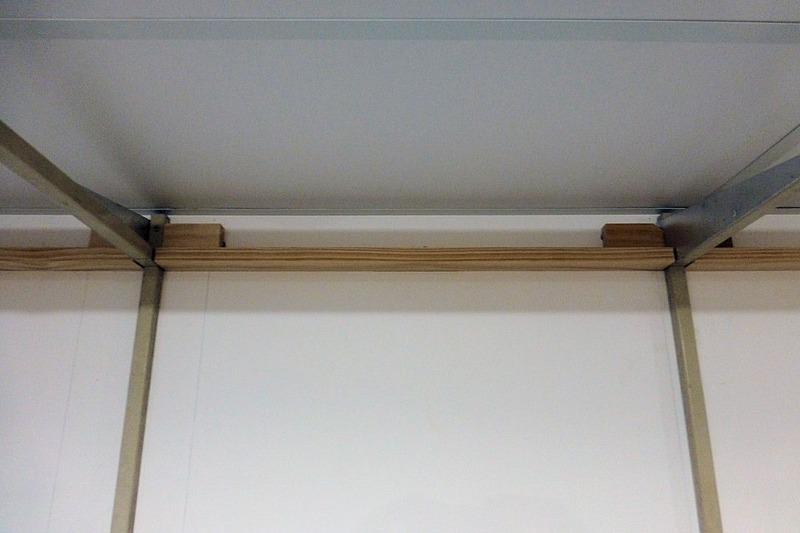 So, simple brackets were made from 1×2 DAR and installed at a 45 degree angle, with the base lifted up around 60mm to allow for the loading gauge of the rear storage road. 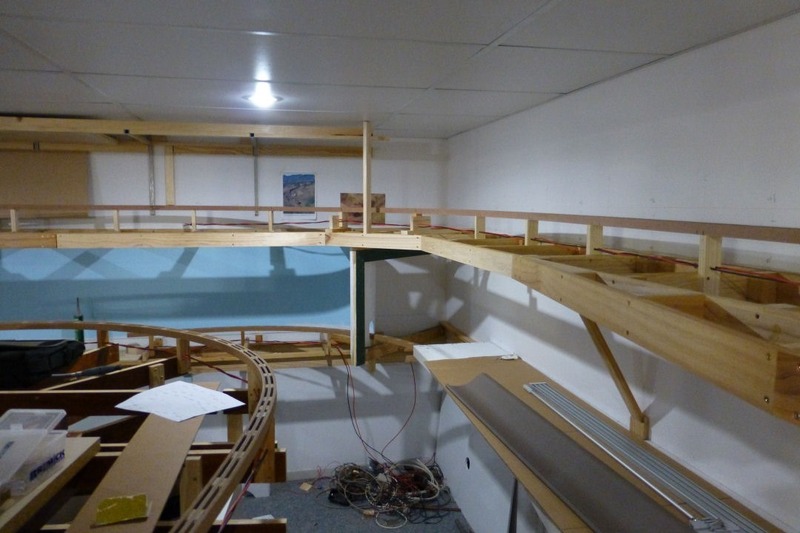 I am going to try and complete the upper deck above the storage yards at least up to the start of the corner, which will require some substantial supports. Over the last few weeks, I had started thinking about how I was going to support the upper deck benchwork from Chilcott’s Ck through and past Kankool. 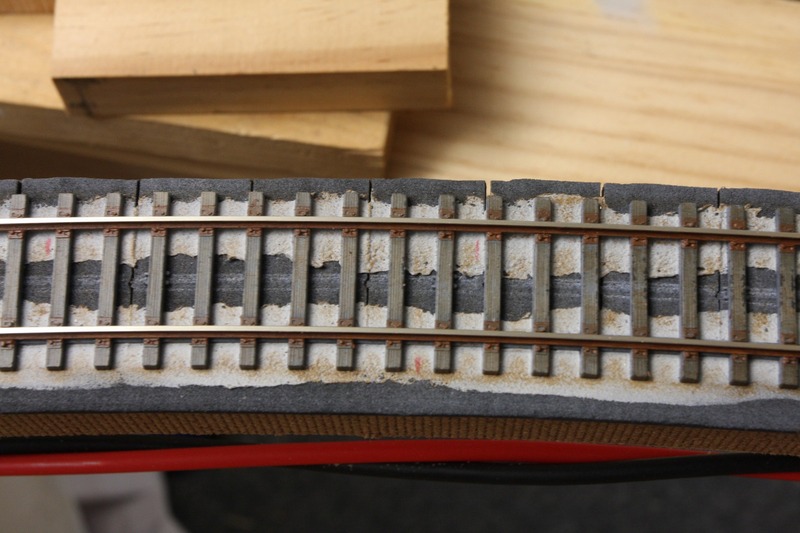 After reading recent posts on a few other blogs I follow, as well as on the Model Railroad Hobbyist magazine forums, I decided to have a go at using open grid framework, self-supported off the wall. I had always planned to give the steel shelf brackets another go, but I was always worried about the bracket being visible in the lower deck’s viewing area. 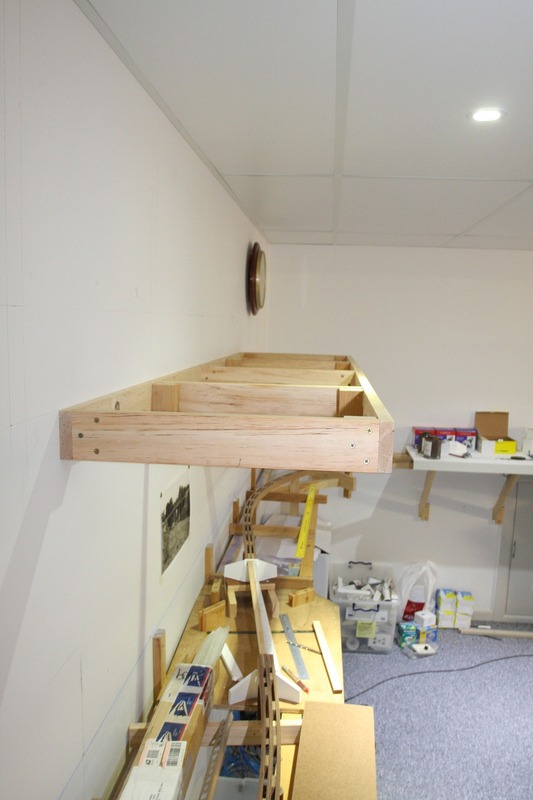 Since the upper deck in this section will only be around 500mm deep, I thought that an open frame could support itself off the wall without the need for additional supports. 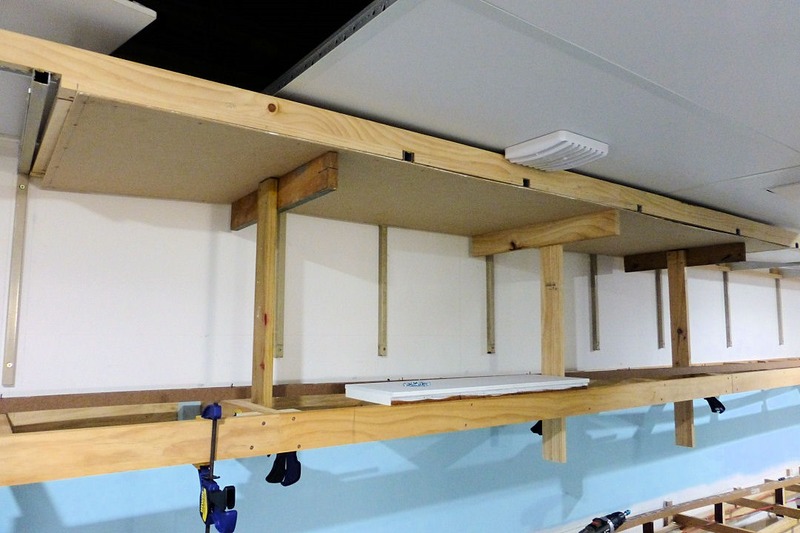 This would leave the underside free of anything that would encroach into the lower scene. 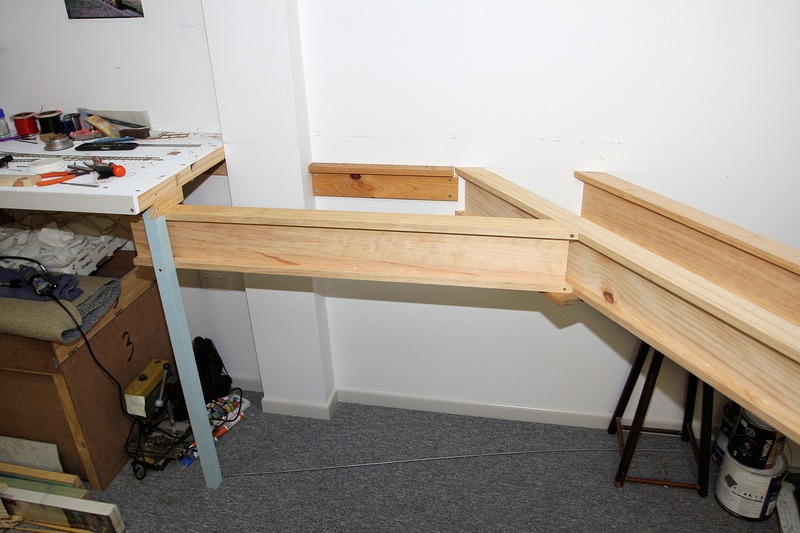 So, on the last day of 2012, I set about making up the first frame from 3×1 DAR pine. 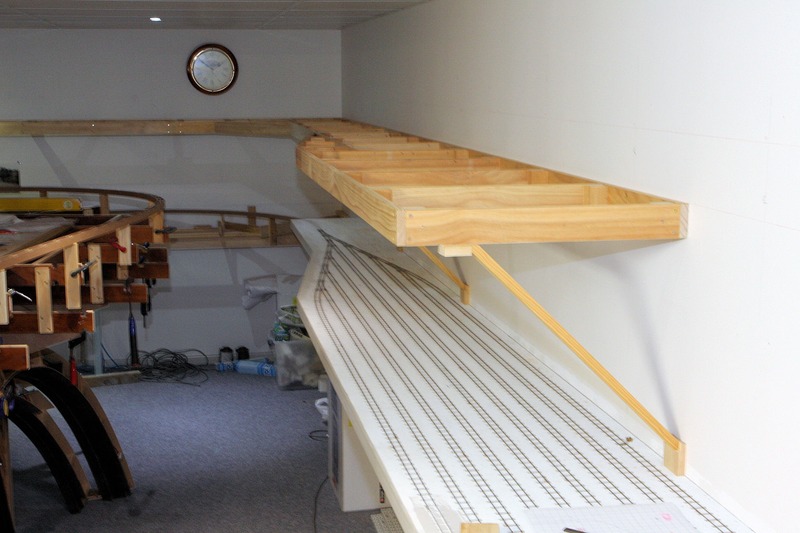 This first section is 1800mm long by approximately 460mm deep. 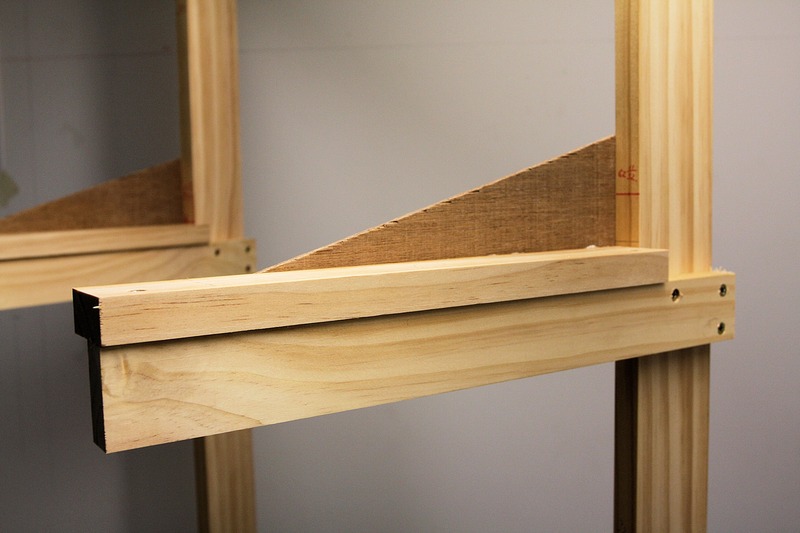 The cross-members were cut at 420mm, and with the DAR pine being 19-20mm thick, I ended up with 460mm. 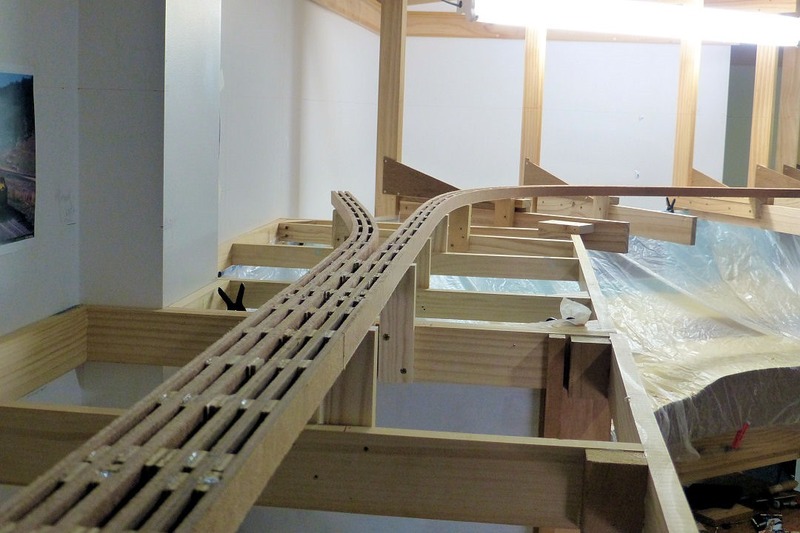 The depth of the upper deck was a bit of a guess at this point, as I still haven’t finalised the depth of the lower scenery yet, but I hope to have it no more than a maximum of 450mm deep on this first run up to the corner before Kankool. The upper deck needs to be slightly deeper than the lower level to allow for the lighting to fall on the front of the scene, therefore I decided to make the minimum depth of the upper deck grid at 460mm, as this would allow me to pack the front edge out as required for the fascia/valance to around a maximum of 520mm, which would give an upper deck overhang of 70mm. 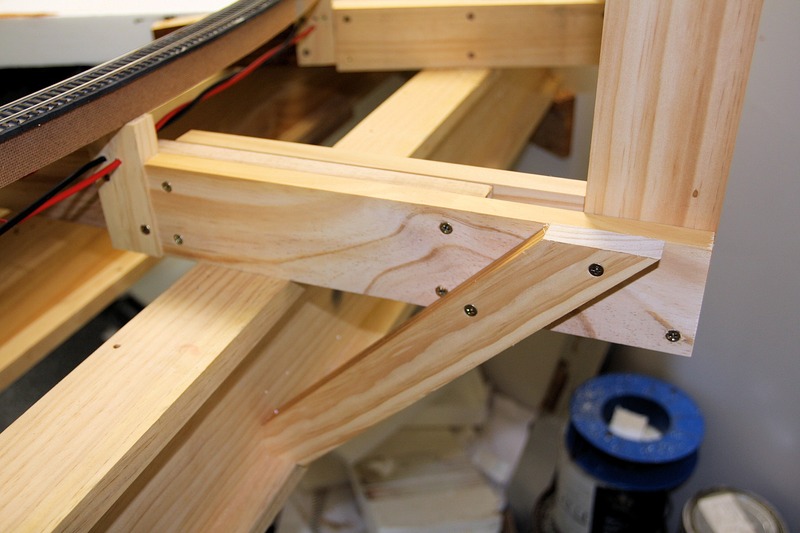 So, the frame was glued and screwed together with blocks in the corner of each cross-member. 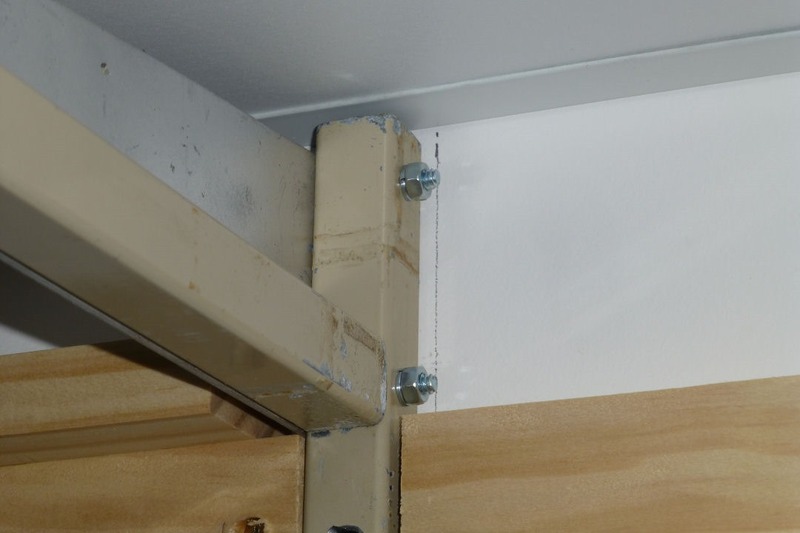 It was then screwed to the wall studs with large decking type screws. The resultant structure is quite strong and seems to support itself pretty well. 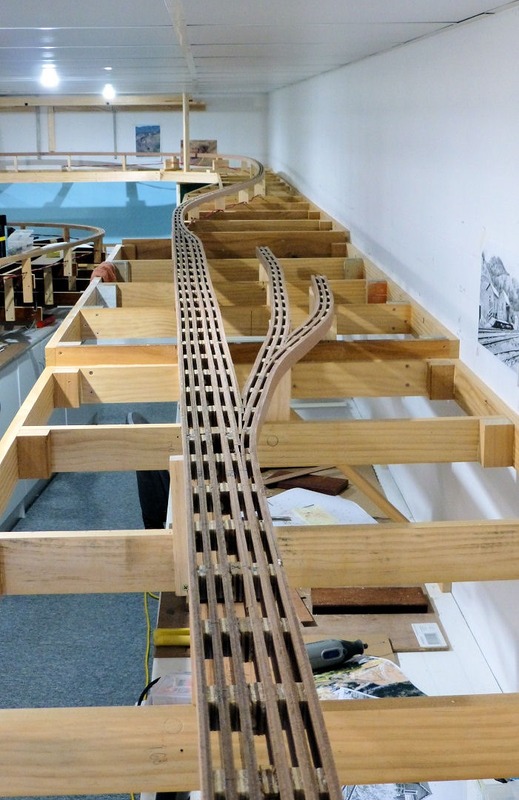 After all, it only has to support the roadbed, scenery, lighting and of course the trains. 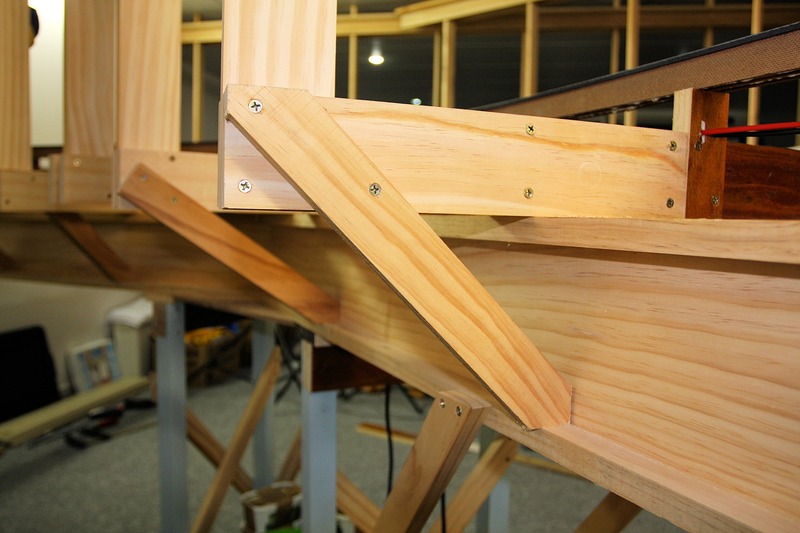 It won’t be susceptible to having people leaning on it, which would require more supports. 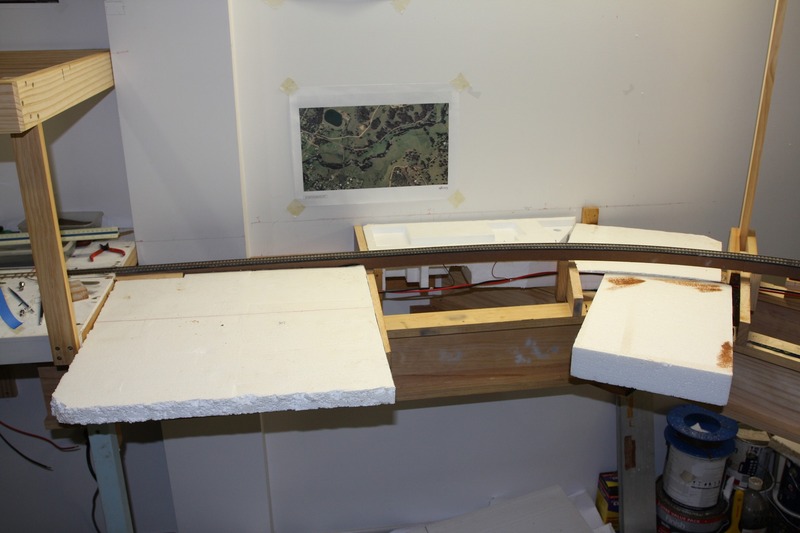 I had to also decide how far below the upper level roadbed height I wanted the framework. 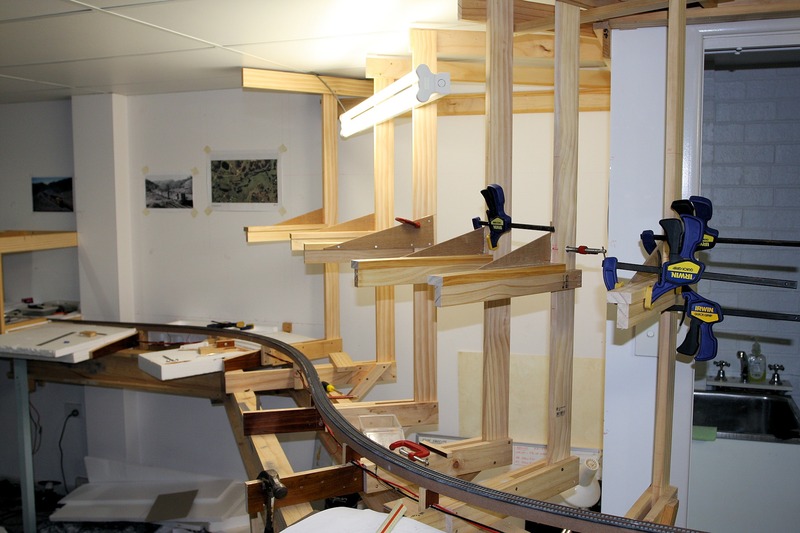 It’s always been hard to envisage how much scenery I wanted below track level in certain areas, but I came up with the magic figure of 5.5 inches. 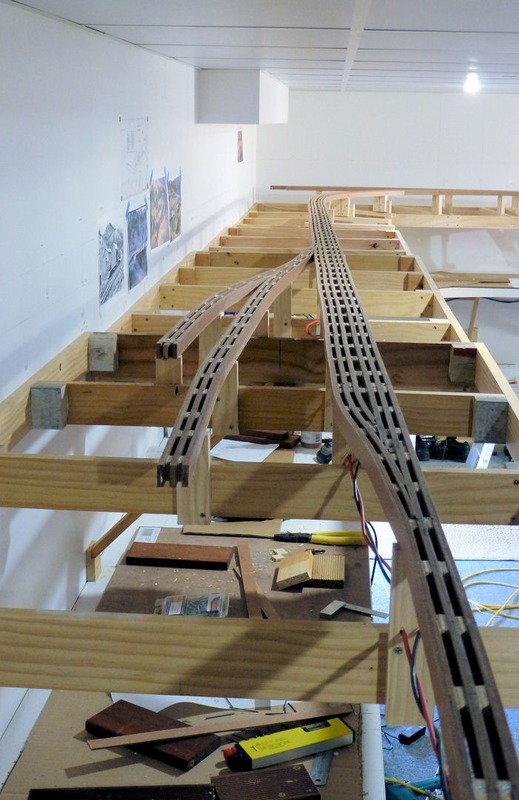 This would give me 40 HO scale feet below track level, which is a fair bit. 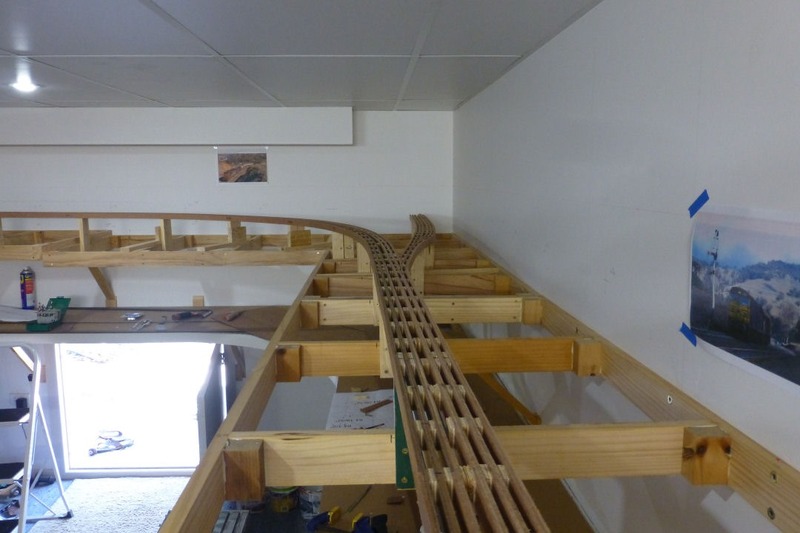 In some locations where I feel I don’t require such a depth below the track for scenery, I may lift sections closer to the 70 inch mark to keep a good lower scene viewing height. 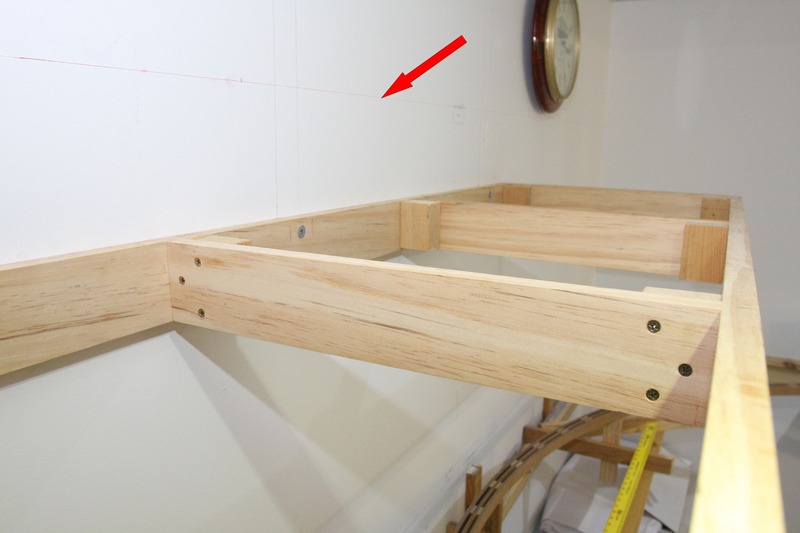 The two pictures below show the frame in place with the red arrow pointing at the 70 inch top roadbed height datum. In the larger picture, the line on the wall may be visible. 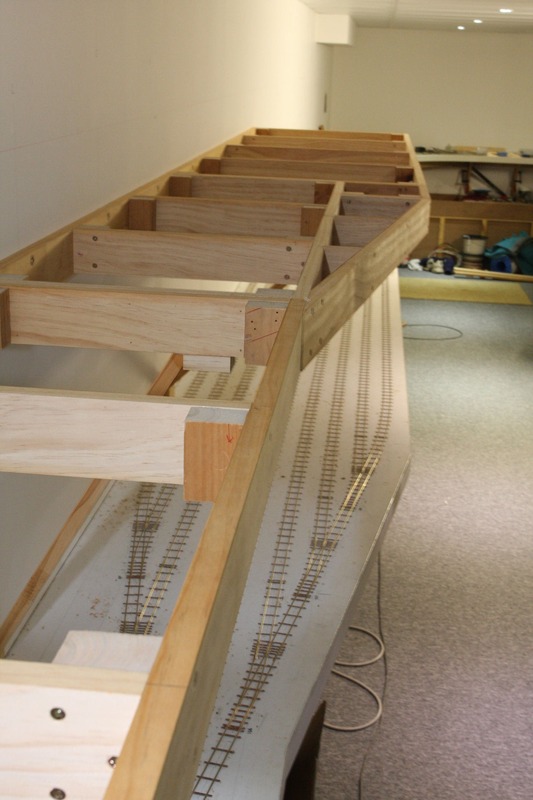 This gives a 19.5 inch vertical height to the lower deck scene/roadbed. This, of course, is based on this location (bridge), but will decrease as it progresses along the lower grade. I will probably fit another two 1800mm long sections in along this wall, before I have to make a corner module to then proceed above Kankool. 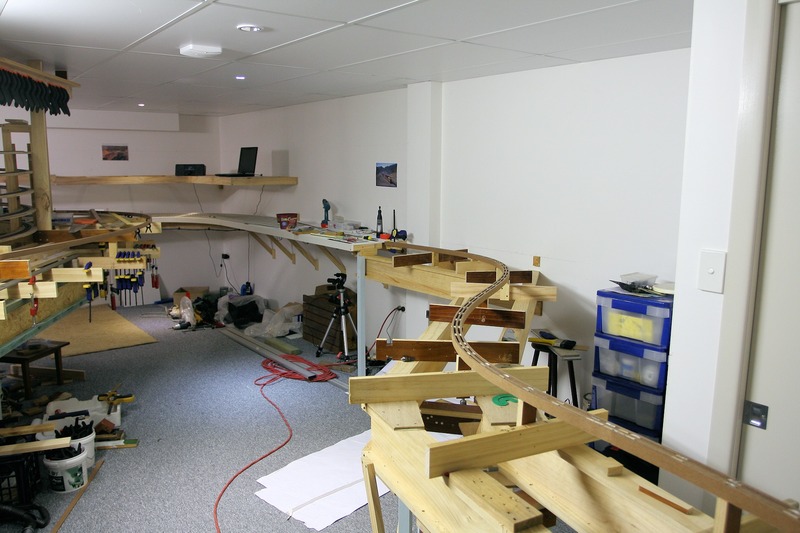 Similar sections will be built above the storage yards for the Ardglen section. 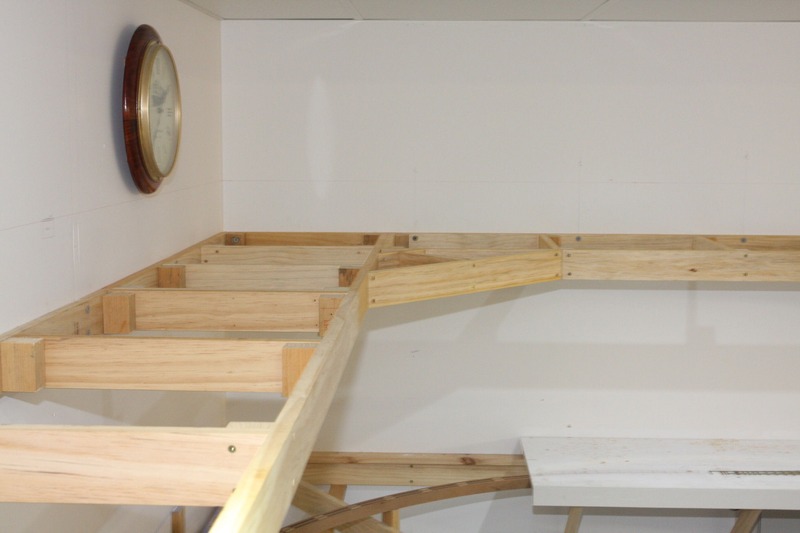 I am also thinking of employing this same technique for the upper valance support structure above the upper deck. It will only have to support itself and lighting. Today I finished the last section of main benchwork as described in my last post. 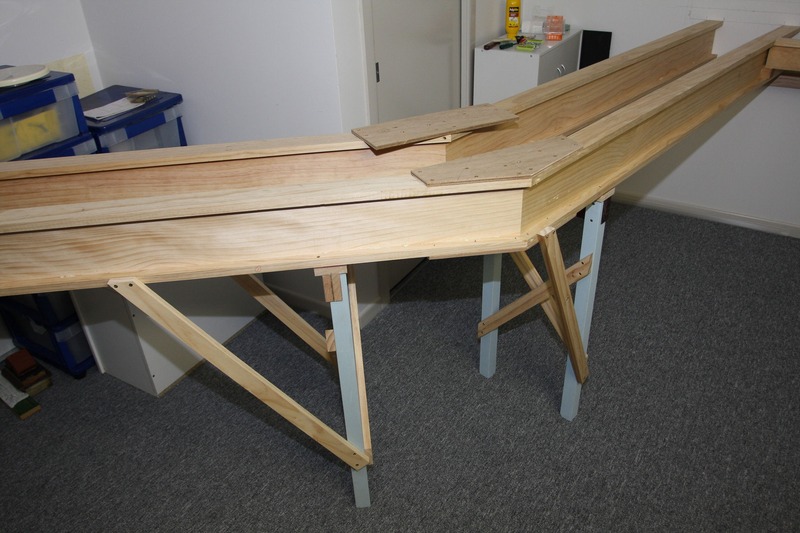 The I-beams were fabricated from lengths of 5×1 and 3×1 DAR pine. A groove was routed into the top and bottom flanges to fit the web then the whole thing was glued together with the urethane glue. 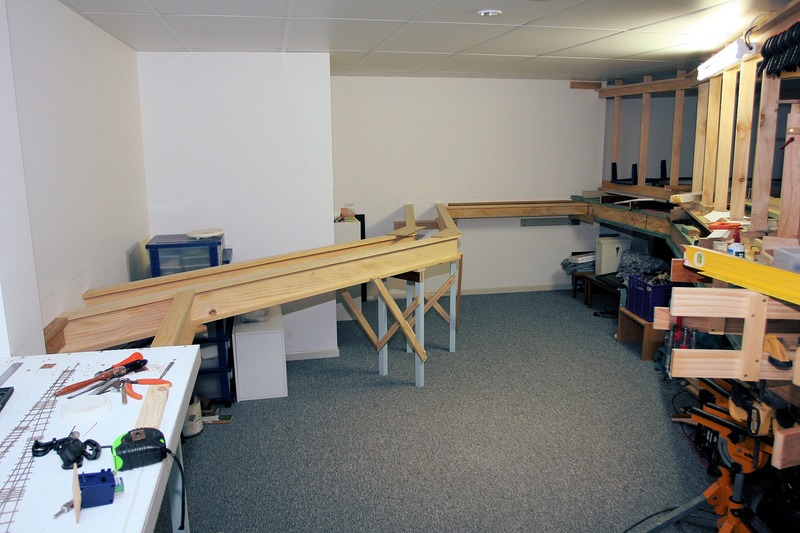 The beams were made in 5.4m lengths and then cut to suit each location. 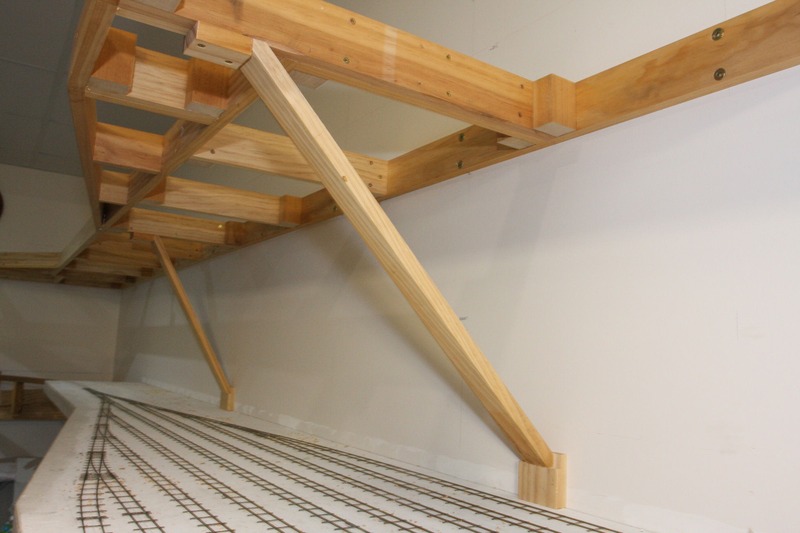 Wall supports for joists are L-girders made from 3×1 and 2×1 DAR. 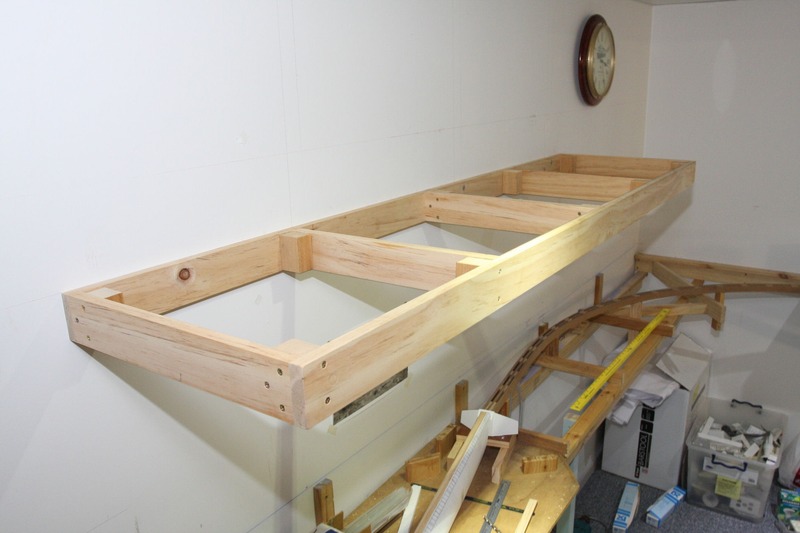 The benchwork is now ready for joists. 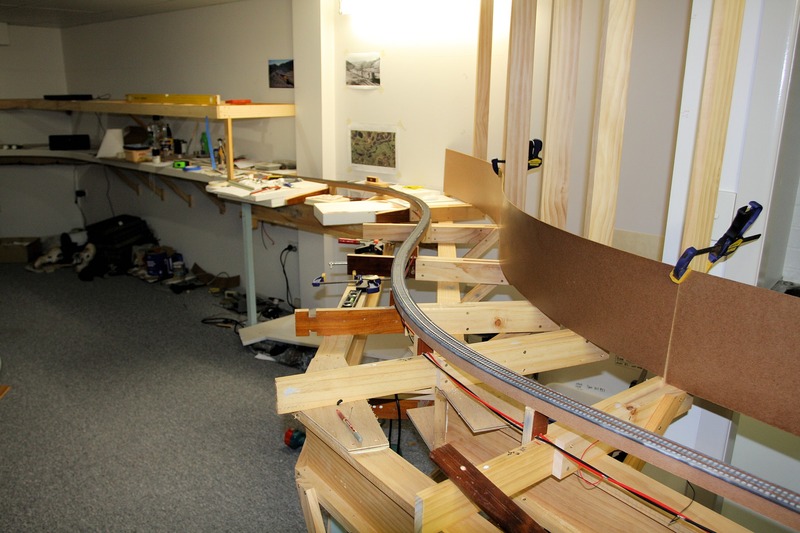 I also need to get some more masonite sheets to cut up for spline strips, then I can continue on with the spline from the helix to the DOWN storage yard.